Irish blessing coffee mug features shamrocks and Celtic knots. Please note that we only have one remaining shamrock mug in stock. This Irish blessing coffee mug with shamrocks and Celtic knot-work is a colorful 12 ounce bone china cup that measures 4" tall. 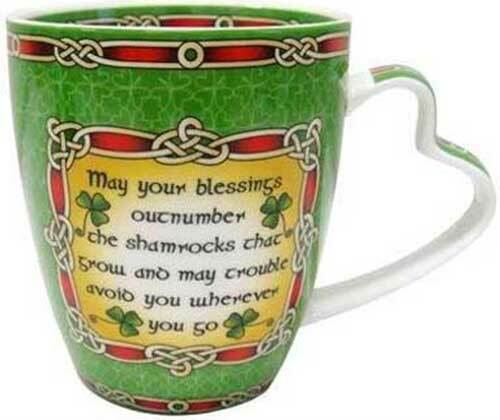 The Irish blessing mug is dishwasher and microwave safe and it features a double sided design. The Irish coffee cup is made in Ireland by Clara and it is gift boxed with shamrock and Celtic knot history cards that are complements of The Irish Gift House. and may trouble avoid you wherever you go.